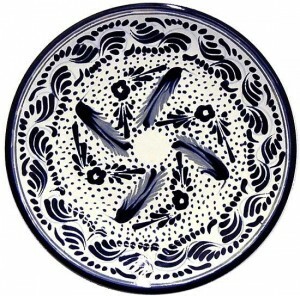 Talavera is a type of maiolica earthenware, distinguished by its white base glaze. Authentic Talavera pottery only comes from the city of Puebla and the communities of Atlixco, Cholula and Tecali, as the clays needed and the history of this craft are both centered there. All pieces are hand-thrown on a potter’s wheel and the glazes contain tin and lead, as they have since colonial times. This glaze must craze, be slightly porous and milky-white, but not pure white. There are only six permitted colors: blue, yellow, black, green, orange and mauve, and these colors must be made from natural pigments. The painted designs have a blurred appearance as they fuse slightly into the glaze. The base, the part that touches the table, is not glazed but exposes the terra cotta underneath. An inscription is required on the bottom that contains the following information: the logo of the manufacturer, the initials of the artist and the location of the manufacturer in Puebla. The design of the pieces is highly regulated by tradition. The paint ends up slightly raised over the base. In the early days, only a cobalt blue was used, as this was the most expensive pigment, making it highly sought after not only for prestige but also because it ensured the quality of the entire piece. Only natural clays are used, rather than chemically treated and dyed clays and the handcrafting process takes three to four months. The process is risky because a piece can break at any point. This makes Talavera three times more costly than other types of pottery. Because of this, Talavera manufacturers have been under pressure from imitations, commonly from China,and similar ceramics from other parts of Mexico, especially Guanajuato. Guanajuato state petitioned the federal government for the right to share the Talavera demonimation with Puebla, but, since 1997, this has been denied and glazed ceramics from other parts of Mexico are called Maiolica or Mayolica.